Income Tax Department issues PAN Card (Permanent Account number) to each taxpayer under supervision of center board of direct taxes.PAN is 10 digit alphanumeric identity card can be used as proof of identity.Income Tax services unit is now brought to you the new online service to change your PAN card data of to correct PAN card data. All PAN card holder now can change/correct your PAN details at Income Tax services unit official website.Apart from this service you also get information on do’s and don’ts for PAN change request online application and important instructions,guidelines to apply for PAN card.Follow the below screenshots to know the application process. Now we can easily correct our PAN Card Data Online and also update PAN Card details in online. How to Correct or Change PAN Card details in online? 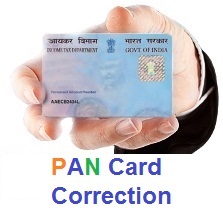 What Document Required for PAN Card Correction? How to get PAN Card Details if forgot or lost? hey i lost my pancard i have the pancard number ,what can i do to get the another pan card.